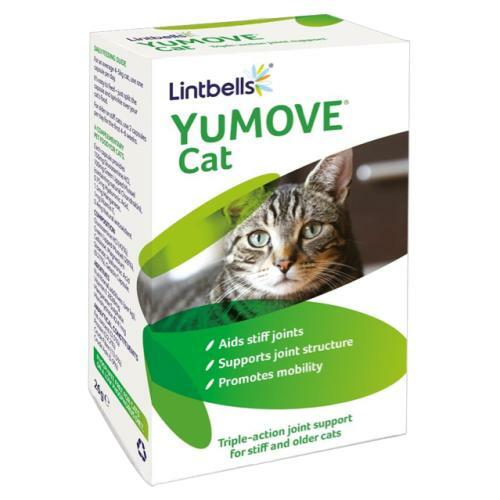 Yumove Joint Support Cat is the popular and unique remedy specifically tailored to aid the joints and mobility of cats! It can sometimes be tricky to see the early signs of stiff joints in your cat, and it's not always just part of getting older. Pets with sore and stiff joints are less active, messy groomers and avoid jumping up or down from higher surfaces. Yumove is brilliant for improving cat mobility! Triple Strength Green Lipped Mussel - a source of concentrated unique Omega 3, that is proven to alleviate stiff joints quickly and improve joint comfort. This Omega 3 is called ETA and is known to soothe stiff joints. Also provides support to tendon and ligament health, which will help flexibility as well as mobility. Hyaluronic Acid - Synovial fluid is the cushioning fluid in cat joints which helps to lubricate them during movement, as well as cushioning against impact. Hyaluronic acid makes up a major part of this. Pure Glucosamine - Made with veterinary strength Glucosamine HCl providing the most concentrated support for cartilage replenishment. Natural Chondroitin - Rich in natural Chondroitin Sulphate from Green Lipped Mussel. This plays a vital role in the prevention of the breakdown of your cat's joint cartilage. For an average 4-5kg cat, use 1 capsule per day. At 1 capsule per day, a pack of Yumove Cat will last your cat for 60 days. Simply split the capsule and sprinkle the tasty supplement over your cat's food. The powder can also be fed on its own, mixed with a little palatable oil such as Yumega Cat or Salmopet Salmon Oil.